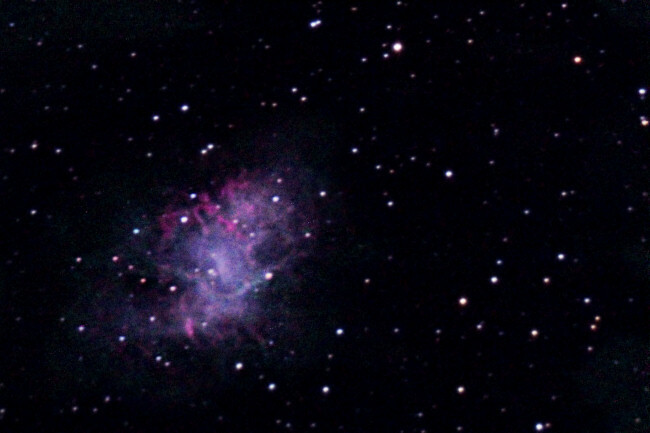 I've never found the Crab Nebula a easy object either find, view or photograph. Modern GOTO telescopes make it easy to find, but viewing it needs some degree of dark sky. Photographing needs long exposures, and even then the contrast with the sky isn't great. On 28th Janaury, after the local stables decided to switch off their floodlights, (abt 9pm!) I gave it another go. A short in the mount power lead was my first problem. This wrecked my alignment. Then somehow the laptop power had come disconnected, and it closed down on me! Having got around these problems, I located the 'Crab' in the 11" and found a star I could guide with in the guidescope. I took 12 x 2min exposures using the 'Canon' + a light pollution filter. It turned out that only 6 of those had guided correctly, but I stacked then to give a passable photo of the nebula. The fainter edges are missing, but some structure is visible. The remains of the exploding star's atmosphere are the red bits! Clearly I need to do some more exposures, and refine the alignment. Given all the challenges you had that night, that's a fine image with only 6 stacked! I've only seen the Crab Nebula once through the MKAS 16" SCT at Canterbury. It's quite difficult to make out visually. I am glad I'm not the only one who has had problems observing the Crab Nebula. I never found the Crab or saw it until I got my 8" GOTO. It is probably easier to spot in good binoculars! I went out again on 30th Jan. I suspect the -6C temperatures might have had something to do with it but the handset kept going into error (under powered). Also the buttons kept sticking overrunning the guiding. I was only able to get a further 2 good images. Rather that admit defeat it occured to me that there was no reason why I couldn't simply add the 2 images from tonight with the 6 I obtained previously. This was the result . . . I'll keep adding images as I go along and see what happens. Hi Aratus I like the image,I was going to go out last night,but was too cold.I have always tried to find the crab,but I can never seem to spot it in my garden, perhaps one day I will find. I'm sure you will - eventually. It is a tricky object. 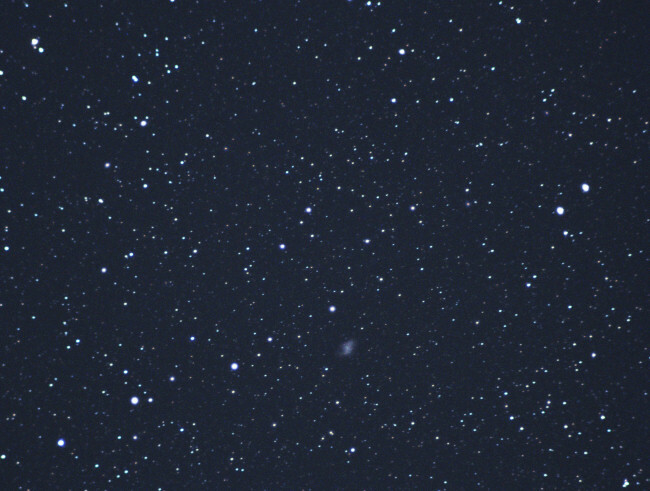 Tonight I was able to add a further 5 frames to the image in a brief 30 min gap in the cloud. The temperature was a balmy 7'C, but the strong wind was blowing the cloud around quite quickly. I did take a few images through the guidescope too. 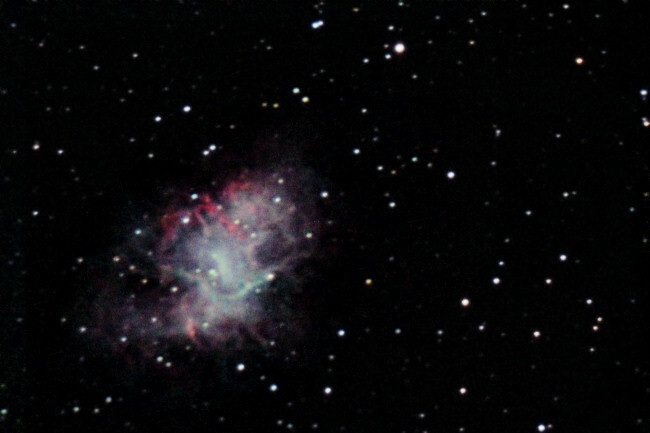 It shows how small the Crab Nebula is, and its low contrast. The image size could fit 6 full moons across. It is a 60sec exposure. I've seen a small fuzzy patch where the Crab is supposed to be. The Man with the Corrugated Iron Roof wrote: I've seen a small fuzzy patch where the Crab is supposed to be. Yes, that's about the best I've seen in an 8" SCT. Mrs G could just about see that there was something there.